Coastal Passage Making Course. During this coastal sailing lesson, one of our advanced sailing courses, you learn what it is like to sail longer distances and experience sailing at night. When you enroll we send you two US Sailing textbooks to study – Coastal Navigation (OSS 105) and Coastal Passage Making (OSS 106). You also receive a comprehensive list of what to bring and what to expect. The first two days of this advanced sailing course are spent ashore as you review and are tested on the Coastal Navigation material you studied at home. Then you get underway for six days of glorious sailing. Here’s a snippet to whet your appetite, written while on the November 2016 Coastal Passage Making Course from one of our Coastal Passage Making Instructors, Joelle Petersen. 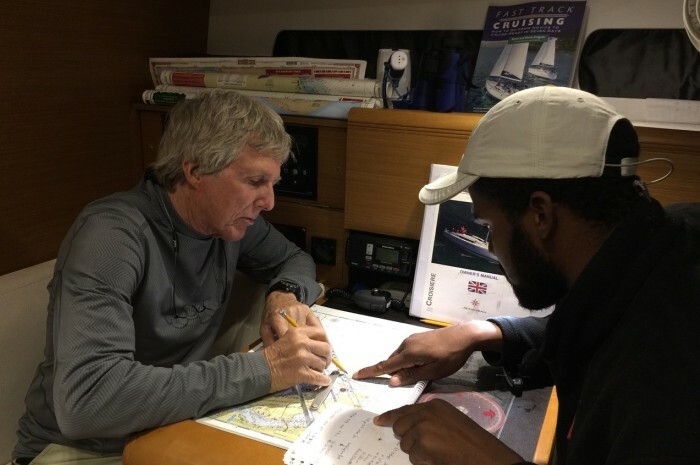 During a Coastal Passage Making Course one instructor teaches four participants. An experienced Coast Guard licensed instructor is with you at all times. Your coastal sailing course includes quality night hours under sail, watch systems, knowing where you are at all times, setting your course throughout the day and when sailing at night. You practice crew overboard recovery methods at sea. Everyone is involved in navigating as you review safety procedures, learn how to cook pre-planned meals underway, and experience sailing after dark. You also practice anchoring and picking up moorings, med-mooring, crew management, passage planning, and weather routing. All rates are per person. Double occupancy means two people are signing up to take the course together and sharing a room ashore and a cabin on the boat. Single means private room ashore and private cabin aboard the boat. Rates are also available for two people who wish to take the course together sharing room ashore, but private cabins on the boat; or taking course together but wishing private room ashore and private cabin on boat. Rates below are in a standard room. Please ask if you wish to upgrade to a larger room or suite. FTCPM May 11-18, 2019 (arrive 5/10) – Ft. Myers Beach – SOLD OUT! FTCPM June 22-29, 2019 (arrive 6/21) – Ft. Myers Beach – SOLD OUT! You will need pencils and erasers and these plotting tools for the Coastal Navigation Course home study program (available from Amazon): parallel rules and dividers. Packages above are subject to change and do not include meals ashore, food or purchases you choose to make, travel or other expenses you may incur. Please see the “What’s Included” tab for Fast Track to Passage Making Courses schedules and rates. Itineraries are given to you at start of course and may change as courses progress, subject to weather and sea conditions. Boats are also subject to change. If you already have US Sailing Coastal Navigation Certification, you can take just Coastal Passage Making Course on most itineraries. In this case, arrive the night before, stay ashore that night, and board the boat the following morning. Please call 888-454-7015 to confirm costs for each passage. Since time of arrival at final destination may vary, plan to depart the following day. Offshore Sailing School knows we cannot thrive without great employees and products. All graduates are asked to fill out an evaluation at the end of the course. The following testimonials come from those evaluations and individual correspondence with recent graduates of the Fast Track to Coastal Passage Making or Coastal Passage Making Course. Many are happy to correspond by email or phone with you. If you would like us to put you in touch with anyone below, please call 888-454-7015 or email sail@OffshoreSailing.com. I wish more women of my age and stature could feel as alive as I’ve felt since we started this quest. We are two of Offshore’s biggest fans and love to recommend you and your organization. These last two courses peaked my sailing confidence with real challenges and practice. 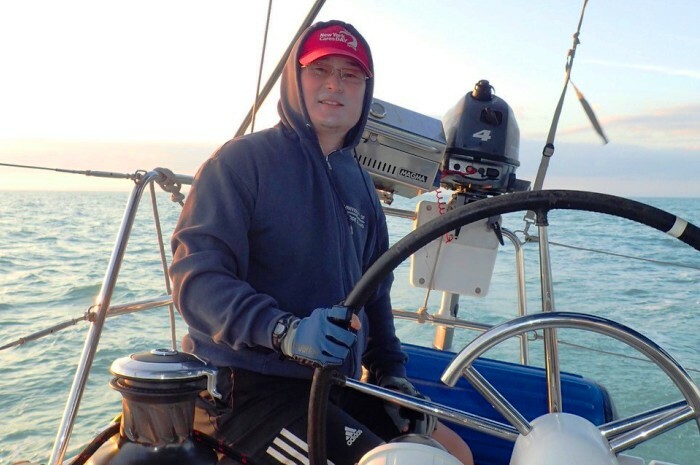 Multiple man overboard drills, using the boson’s chair to go up the mast, navigating narrow entrances to harbors and marinas, and many hours of sailing after dark all contributed to a perfect learning experience. Jim and I just got off the catamaran from our Passage Making course. We had an invaluable experience. No matter what your skill level in sailing, no matter how much you think you know or you know you don’t know, there is more to learn. Because of the instructors, I have the confidence in any situation to say to myself, this must be done and I can do it. There’s an old proverb that says “to travel is better than to arrive – it’s the journey, not the destination.” My time with Offshore endowed me with more than just a lifelong skill: I came away from this experience with a renewed sense of purpose and a desire to live life better. I was a student in the Fast Track to Passage Making course based out of Captiva in May 2009. This was my third course from Offshore. I found the course to be challenging, packed with useful practical information and very enjoyable. I think the course fits very well at Captiva, the route we took was perfect for what we were being taught. I also expect that there are many potential students who think about Southwest Florida as a place to cruise in their future and the location of this course at Captiva gives them a chance to apply the skills they are learning to this area. Overall, the course exceeded my expectations in what I had hoped to learn and I found it very rewarding and fun. I would recommend the course to anyone who has reached the level of experience necessary for the course and who wants to advance their knowledge of cruising skills. However the key to the success of any such intensive course is the quality of the instructors. I give Kevin and Andy the highest marks in this regard. My wife and I enjoyed the entire experience. It was challenging and exciting to acquire new sailing skills through hands-on experience in the classroom and on the passage. We are looking forward to Celestial Navigation and Offshore Passage Making courses in the future. 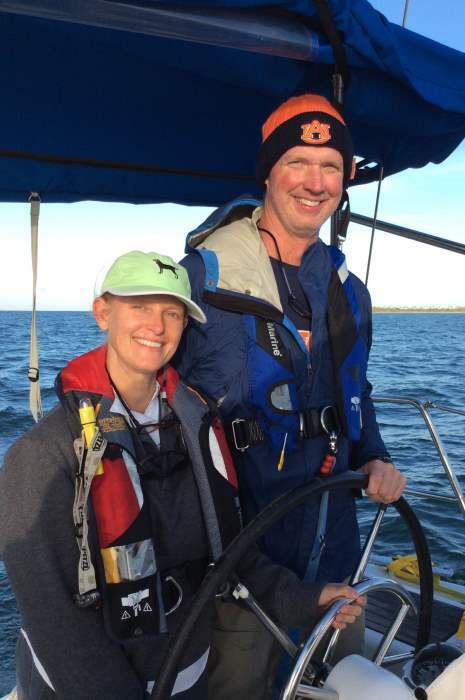 As an experienced sailor, watching my wife develop her sailing skill and confidence made for a great outcome. Thanks for helping us to sail as a couple. With Mark’s and Bart’s assistance, my confidence soared and I now feel very comfortable with my sailing skills. I have shared with my friends that the Fast Track to Coastal Passage Making experience was one of the most personally challenging, thrilling and fulfilling educational experiences of my life. Now I am able to confidently and competently practice my sailing skills and share my husband’s love of sailing. For me, it brings to mind a timeless quote by Mark Twain, “Twenty years from now you will be more disappointed by the things that you didn’t do than by the ones you did do. So throw off the bowlines. Sail away from the safe harbor. Catch the trade winds in your sails. Explore. Dream. 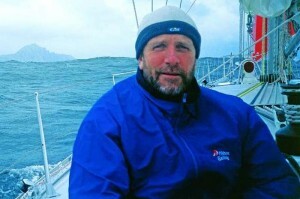 Discover.” Offshore Sailing School has given me the skill and confidence to do just that. Thank you for a wonderful experience. Mark was very supportive and helped me to improve my existing skills and taught me new skills. He did this in a supportive and enthusiastic manner. This was a fabulous learning vacation experience which taught me more about sailing and myself. Appreciated real-world pragmatism. The instructors had great ability to teach a lot of material in a short time without any feeling of pressure. Kevin and Mike were excellent instructors. They let the students try many new things by themselves that increased our confidence level. They were very patient and reassuring. We had a tough passage from Miami to Captiva via Key West in bad weather. The sailing was difficult, and the learning experience was outstanding.